June 24/00 – Taste of Urban Fare: Flash 5 sampled lots of hungry passers-by on this sunny Saturday. It was an indoor/outdoor gourmet food and wine show, at Vancouver’s Urban Fare gourmet grocery store. June 17-18/00 – Lion's Society 24hr Relay for the Kids - Flash 5 had a team of runners on the course all day and all night, and a volleyball team that dominated the tournament. Each lap of the course was 2.2 miles, and our team members completed the final parade lap sporting full Flash 5 colours. In the end we had many pairs of tired legs and a nice pool of pledges to help "Give Children Abilities"
June 11/00 – The Flash 5 Vancouver Sprint Triathlon and Duathlon at UBC: Our first title sponsorship went well. We refueled the athletes with sample shakes and bars. 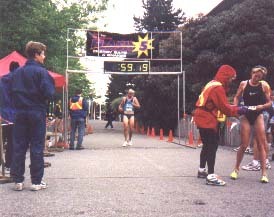 May 12/00 – Womens B.C. Rugby Highschool Championship: Flash 5 sampled bars and gave out shakes at this event. Many of the girls craved instant energy, they shook their shakes up on the field in their water bottles. Quick, easy and tastes great! Jan-Apr./00 – We congratulate the Burnaby Lake Rugby Club on another successful season. Flash 5 provided the players with bars on game days. May 6/00 – Tour de Vine (Penticton Bike Race): Lots of bikes, lots of wine, and lots of Flash 5 to energize it all. It was a cold windy day in the Okanagan, but a new trick was learned! Mochaccino Flash 5 shake mixed in black coffee makes a warm tasty treat! Apr. 23/00 – Coalmont to Princeton Race: Flash 5 was proud to provide fuel for this intense run! March 2000 – Attention all sports fans……6000 Grizzly and Canuck fans were given Flash 5 samples at the skytrain station. March 18/00 – Cypress Mountain: 2000 Boarders and skiers received an energy bar that actually stays chewy and moist in the cold weather! March 24/25/26/00 – The Calgary Outdoor Adventure Sports Show: Another city and another great adventure show. Samplers, again, could barely keep up with the line up of people seeking a taste of our new bars. Feb. 25/26/27/00 – The Wellness Show: Flash 5 sampled bars and shakes at this show. Both showed to be a hit as people were buying them by the box. Feb.18/19/20/00 – The Vancouver Outdoor Adventure Sports Show: This was one of out busiest shows yet! The energy level was high all around. Our samplers could barely keep up to the heavy traffic at our booth. The mountain bikers were hustling over for seconds and thirds between races! Feb.12/13/00 – Vancouver Boat Show: It was a sunny but extremely windy day down on the water. We held on to our tent poles with one hand, and handed out over 600 bars with the other! Feb.6/00 – Steveston Icebreaker Run: The ocean air was chilly , but runners kept themselves warm and we kept them energized at our Flash 5 tent. 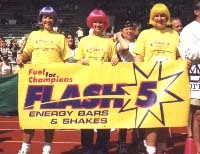 Oct.10/99 – The finishers of the Victoria Marathon thanked Flash 5 for helping them go the distance! 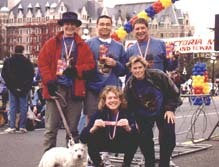 Oct. 3/99 – Hazelmere Valley Run: We sampled our shakes for the first time at this event. The blenders roared every few minutes and the shakes were a huge hit! Sept. 12/99 – Cresent Beach Derby Run: Flash 5 was proud to be a part of this event. We fueled hundreds of runners on this sunny day! August 11, 1999 FLASH 5 tees off at the BC Junior Golf Classic at Belmont Golf Course in Fort Langley, BC. FLASH 5 Bars were just what the golfers needed to keep them going out on the course. 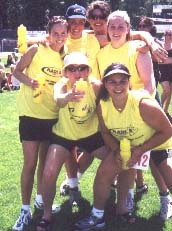 July 24, 1999 FLASH 5 fuels some very serious athletes at Vancouver, BC’s portion of the Adventure Racing Canada Series. This series is a unique teamwork challenge that combines mountain biking, trekking and paddling. Teams travel up to 50km (all sports combined), facing unexpected obstacles and "mystery tests". July 11, 1999 FLASH 5 is proud to have been a part of the BC & Yukon Heart and Stroke Foundation’s Danskin Women’s Walk & Run at Locarno Beach in Vancouver, BC. The event was a success and we were happy to supply some extra energy for the participants. June 15, 1999 Camp of Champions update: It’s week two and although the sun’s been in hiding, Camp is in full swing and the campers are fueled by FLASH 5! Our Webmaster and team rider, Aaron, has recovered (somewhat) from his spring injury, and has sent us down some photos of the big air and big fun that’s happening so far. May 9, 1999 Ben Widsten, FLASH 5 Motocross competitor, places first overall in the 125 Novice class of the 1999 Peace Motorcycle Association (PMA) Motocross Series in Taylor, BC. May 1, 1999 FLASH 5 begins its sponsorship of the Western Lacrosse Association (WLA)’s North Shore Indians. FLASH 5 will be taking to the road as the Indians gear up for their six game War on the Floor series in sunny Kelowna and Vernon, BC throughout June and July. April 2, 1999 FLASH 5 Energy Foods is proud to be selected as a sponsor for the 1999 “Camp of Champions” snowboard and ski camps at Whistler / Blackcomb in Beautiful British Columbia Canada. Flash 5 promotes their product as “FUEL FOR CHAMPIONS”, so this sponsorship fit is just the sort of thing that the company plans to pursue in the future. Camp attendees will be receiving a supply of Flash 5 Energy Bars and Shakes to help them with endurance at this seriously challenging camp. Good luck Champions. P.S.. Our own Webmaster and team rider, Aaron Schroeder, is now healing up after suffering an extreme wrist and arm fracture at Whistler two weeks ago. He plans to attend this summers camp and hopes to be able to do more than just hand out free Flash 5 Energy Bars to the happy campers. April 3, 1999 Our athletic sponsorship program has begun with a number of applications being considered to date. With the summer season approaching, we encourage others to contact us for sponsorship opportunities. April 3,1999 FLASH 5 is proud to announce a sponsorship and endorsement contract with Motocross competitor, Ben Widsten of Prince George, Canada. Ben will be sporting the FLASH 5 colours for the 1999 racing season. Good luck Ben.